Kosumalli/Kosambari: Kosumalli or Kosambari is a quick healthy salad that is made with split green gram. 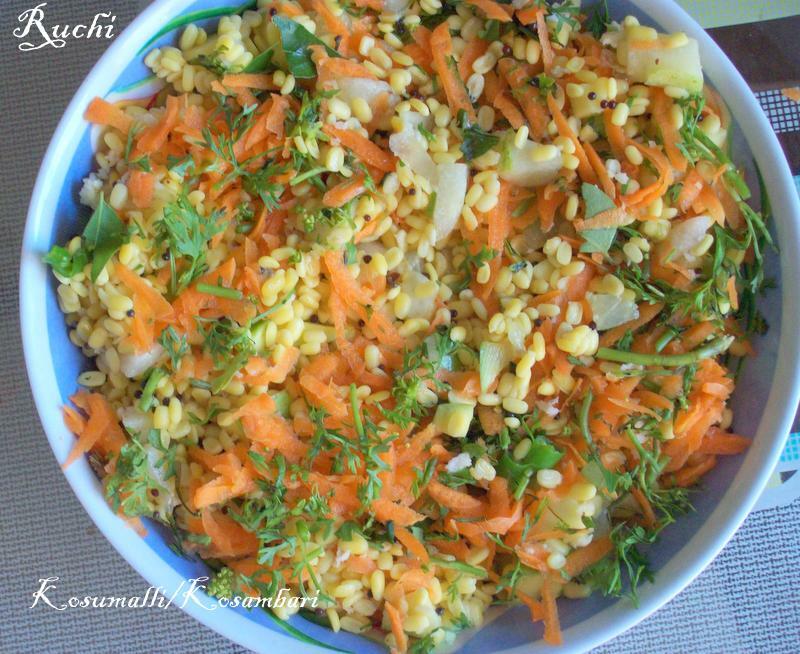 It is very easy to make .This salad with low fat, low cholesterol, high protein and high fiber packed with all the good nesses of carrot and moong ! Kosumalli is prepared as a spicy salad with moong dal (split green gram) and red chillies and seasoned with mustard seeds and curry leaves. We can even add grated carrots, beetroot , cucumber and cabbage to make it even more healthier! 1. Soak Moong dhal in water for 1 hour. Drain the water and Squeeze out and take in a bowl. 2. Grate cucumber, carrot, mango Mix all with salt, coriander leaves and curry leaves and add to the dal. 3. Fry green chillies in oil along with mustard seeds and mix with salad. Then add lemon juice mix nicely. 4. Before serving add fresh coconut . Wat a healthy and colourful kosumalli.